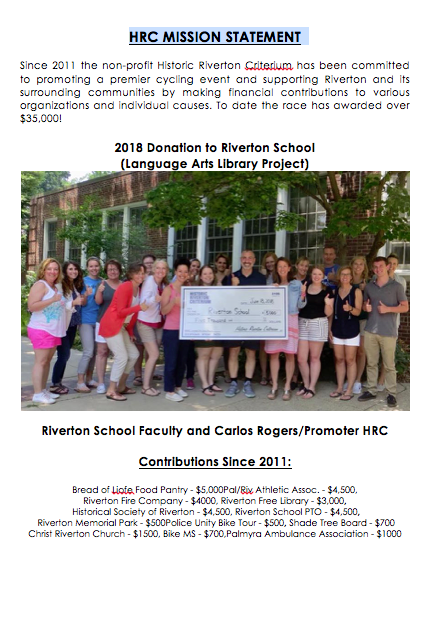 On June 9, 2019, Carlos Rogers, Riverton’s most preeminent advocate and civic champion, will reprise his role as the promoter of the premier bicycling event that he originated in 2011. The Historic Riverton Criterium is now firmly established as the town-wide family friendly tradition to which we now look to kick-start the summer. This year’s contest is likely to draw a thousand participants, spectators, residents and vendors. Carlos started planning for this 9th Annual HRC almost as soon as the 8th concluded. Each year’s event draws more competitors and fans, but each year also means securing the financial backing to underwrite the costs of staging such a complex event. Carlos has recruited an impressive roster of corporate sponsors to support the Historic Riverton Criterium. Several have been with him since the first one in 2011. Now is the crucial time to gain grassroots support, donations, and endorsements. See the attached sponsorship packet for information on how you can throw your support behind this great event. Your participation can make this 9th Annual HRCriterium the most spectacular and productive one yet and make everyone a winner! Mirriam-Webster defines criterium as: a bicycle race of a specified number of laps on a closed course over public roads closed to normal traffic, but that doesn’t begin to cover it. 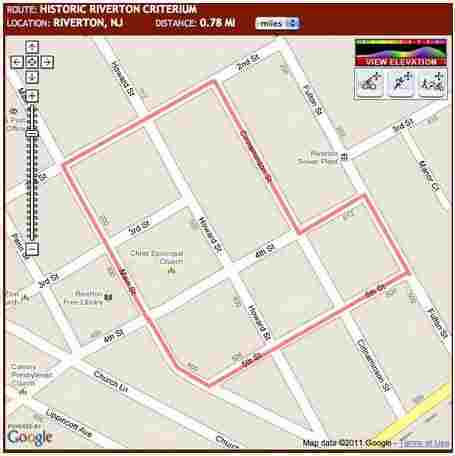 Amateur and professional women and men complete 15-40 laps on 0.8mi, 6 turn, flat and fast course through the historic, tree-lined streets of Riverton, New Jersey. Cyclists compete in several categories, including Pro-Am Men, Amateur Men, and Amateur Women. Even the kids get in on the fun with races sandwiched between amateur races and trophies and medals going to participants. Live music, food trucks, Wade’s Snow Cones, and a balloon twister add to the block party atmosphere as spectators enthusiastically cheer on competitors this USA Cycling sanctioned bicycle race. Returning for the ninth consecutive year, Historic Riverton Criterium serves the dual purpose of providing a unique hometown venue for bicycle racing while raising funds that benefit community organizations and charities. Incredibly, the NJ nonprofit 501(c)3 organization has awarded to date over $35,000 to at least a dozen worthy causes. Full disclosure, the Historic Society of Riverton will benefit from part of the proceeds this year. Everyone knows we have been fans of the HRC since Carlos the beginning. Heck, we each have the word HISTORIC in our names! Carlos once explained that the reason for his inspired description of the race as “historic” was Riverton’s great tradition of bicycle racing going back to the 1890s. Read more about Riverton’s cycling legacy in the only place where you can learn about the awesome characters and fascinating stories that have contributed to Riverton history since 1851. Won’t you please help spread the word so this worthwhile community event gains the financial support and attendance it needs.